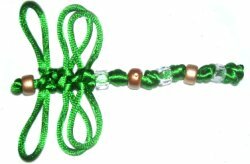 Description: The Satin Dragonfly is a great Macrame project for beginners and children, since only 2 decorative knots are used to make the entire dragonfly. The most challenging part is the wings, but with a little time and effort, anyone can make this appealing decoration. Satin cord was used in the example shown, but you can use other materials. The beads shown are glass crow rollers, but you can use plastic pony beads. The size of the dragonfly is approximately 4 inches (head to tail) using 2mm size cord. You can make the dragonfly larger if you use a different type of material (3mm to 4mm size). Step 1: Cut one cord, 2 yards long (72 inches). 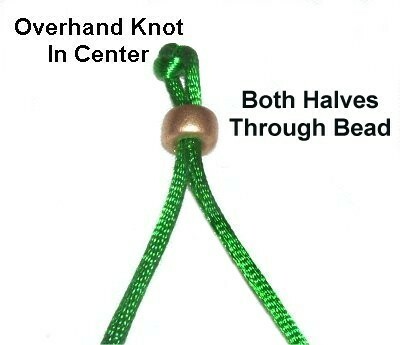 Overhand Knot: Hold the cord in both hands. Make a loop, crossing the left end over the right. Bring the left end through the loop from below. After it's tightened, pass the ends through the bead, one at a time. Satin cord is easily damaged by pins, which is why you should never push them through the material. You can lean the pins over the cord, or use the Cross-Pin Technique. 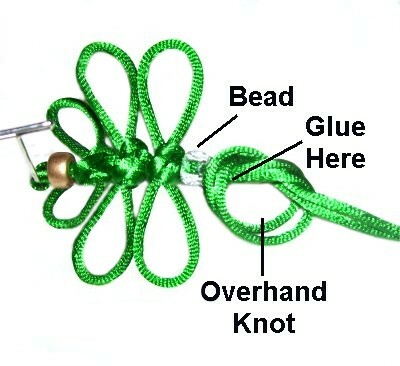 Step 2: Secure the head of the Satin Dragonfly by passing the pin through a space in the Overhand knot you just tied. 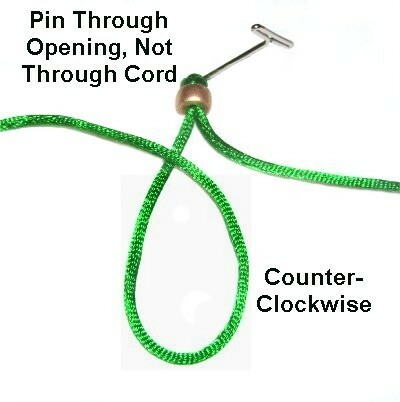 Use the left half of the cord, and make a loop in a counter-clockwise direction. 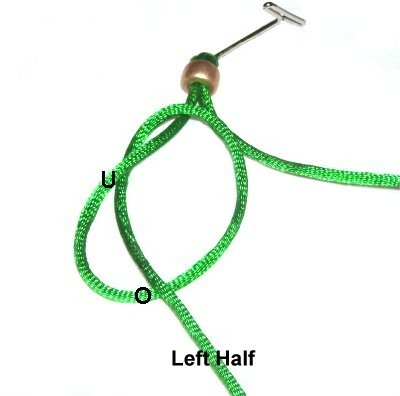 Step 3: Complete the Overhand knot by moving the left end through the loop under - over (from below). Do not tighten the knot. Step 4: Pass the right half of the cord through the knot you just tied, as you rotate it clockwise. Make sure it goes through the loop over - under as shown (from the top). As you pull it right, pass over the cord you are working with (right half). 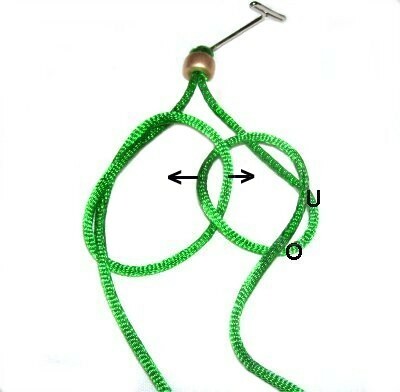 Step 5: Complete the right Overhand knot by passing the end through the loop under - over (from below). 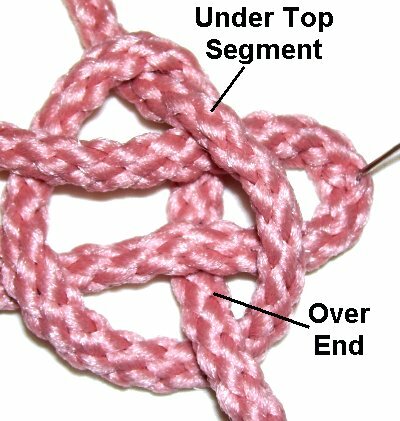 Arrange both knots so you can clearly see the inner and outer portions. Try to place them close to the bead, and keep them wide with plenty of space. The arrow shows how you will mover the inner portions in the next step. 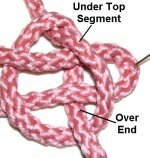 Important Tip: The inner portion of the two knots is the rounded area, also called the crook. The outer portion is the crossed area. Step 6: Hold the inner portion of the left knot and move it to the right. 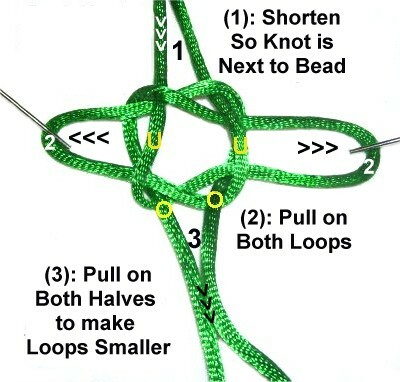 Pass it through the outer crossed portion of the right knot. 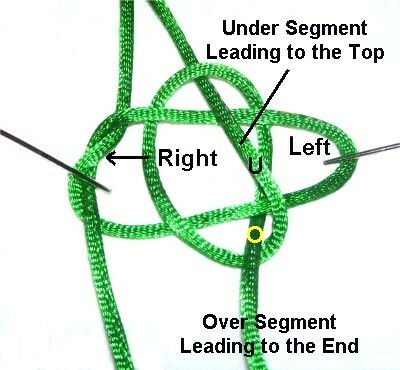 Move the inner portion of the right knot to the crossed area of the left knot. Bring it through the same way: Under the top segment, and over the portion that leads to the end. Step 7: As you tighten the wings for the Satin Dragonfly, push it up as close to the bead as possible. Adjust the knot as needed, removing the slack above the knot. Pull on the loops first, while holding the ends steady. Once the center is tight, pull on the ends to shorten the loops. They should be about 1 inch long. Repeat steps 2 - 7 at least 2 more times, to make extra sets of wings. Try to place them close together. Step 8: Apply glue to the back of the Hanger knots and allow it to dry. 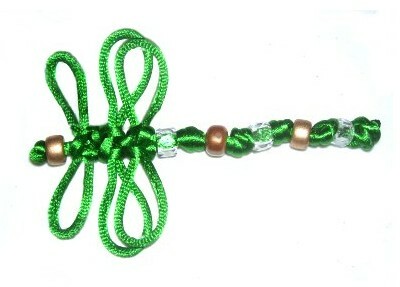 Add a bead to both cords, as you did the first one at the top of the Satin Dragonfly. 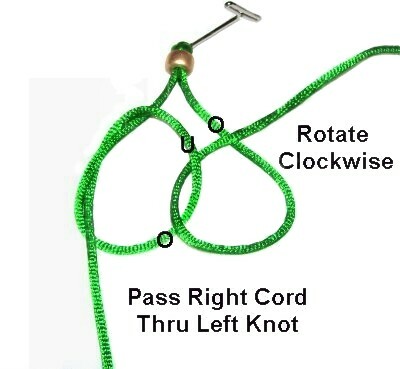 Tie an Overhand knot using both ends working together as shown. Apply glue inside the knot before tightening it. Step 9: Repeat step 8 several times, until the tail is the size you want. The last knot you tie needs to be glued inside as well as outside. Let it dry and cut off the extra material. Have any comments about the Satin Dragonfly? Contact Me.